Taste test: This was a graham cracker with a thin chocolate coating underneath and a thick chocolate coating on top. The top chocolate had a flattened marshmallow embedded inside. The chocolate tasted good. The marshmallow was too chewy, almost like chewing gum when I first bit into it. 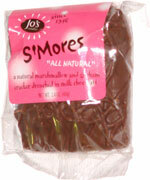 There wasn't any of that melted marshmallow feeling or taste that you get from a real s'more. Smell test: Nice, mild milk chocolate and marshmallow smell.